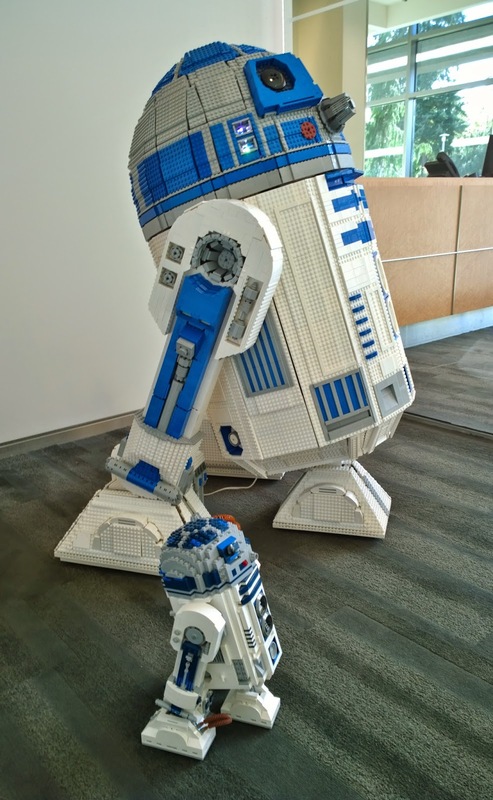 L3-G0, a life size Lego R2-D2 attended ECCC (Emerald City Comicon) in 2014. It took me a bit to get the video and stuff organized, I've been busy, so the post's been delayed. 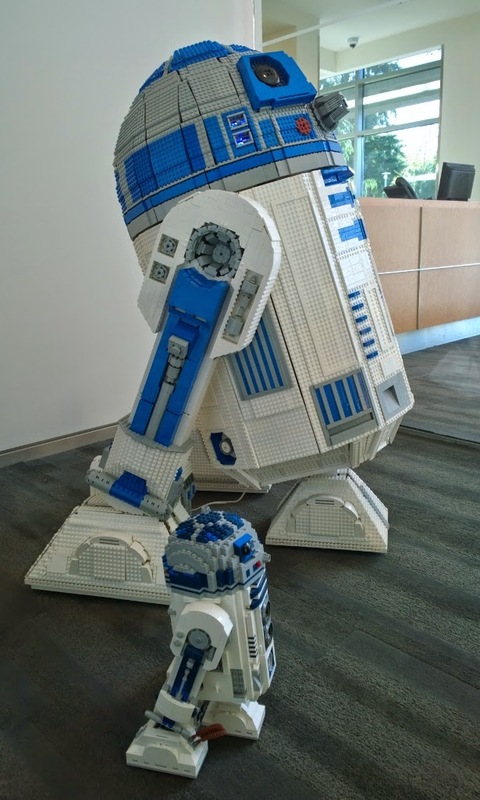 In case you're new here, as far as I know this is the first time a complete full sized Lego R2-D2 has been displayed in public. L3-G0's been "out" a couple times (at Microsoft, Lowe's and a Sealug meeting), but not with all his bits. By completed I mean that as in "just completed." The last bit got complicated and he didn't show up until nearly the last minute before the doors opened. The video has several short segments I thought showed pretty much the experience, skip ahead if you don't like a piece, the parts get better. L3-G0 with some of the fans taking pictures, even Unikitty! The astromech parade with other Pacific NW R2 Builders Club R2-D2s and other droids. The crowd and going back to "Brick Nation" where the Lego exhibits were. A short encounter with a taller pirate. Darth Lily, one of L3-G0's more enthusiastic fans. L3-G0's shopping spree, it is a con after all, you've gotta buy something! Keeping all those pesky Daleks away from Brick Nation. People don't seem to be getting past the first bits so I might post individual videos later, however if you want to share only one bit with your friends, YouTube lets you share starting at a certain time. Or just ask them to skip to 3:57 or whatever. I forgot to include a bit on packing him up :( Too bad you can't edit YouTube videos. 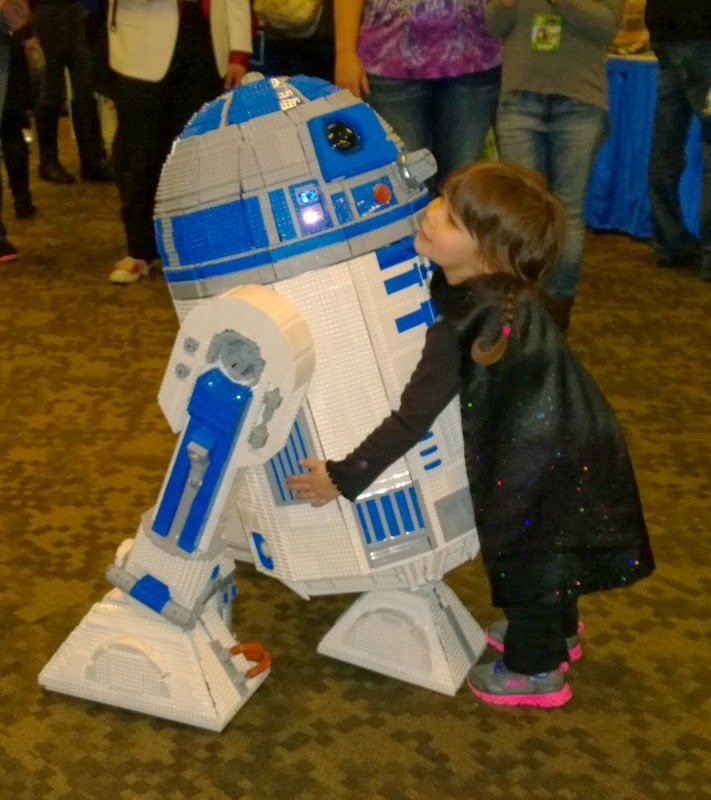 Darth Lily comforting R2-D2 after she scared him so badly. L3-G0's on the right with the other club droids. It's kinda cool to see him next to the other droids. The ankle details on his right ankle are backwards, fortunately it's hiding in this photo. I was so mortified when I noticed that a couple weeks after the con. I liked this nook while waiting for the droid parade. Reminds me of Jabba's Palace for whatever reason. (Not saying anyone else would make that jump, but I did). Thanks for stopping by, hope you enjoyed the ECCC 2014 report. R2-D2 is supposed to have an angle between the legs and vertical of about 18 degrees for a total of 36 degrees. 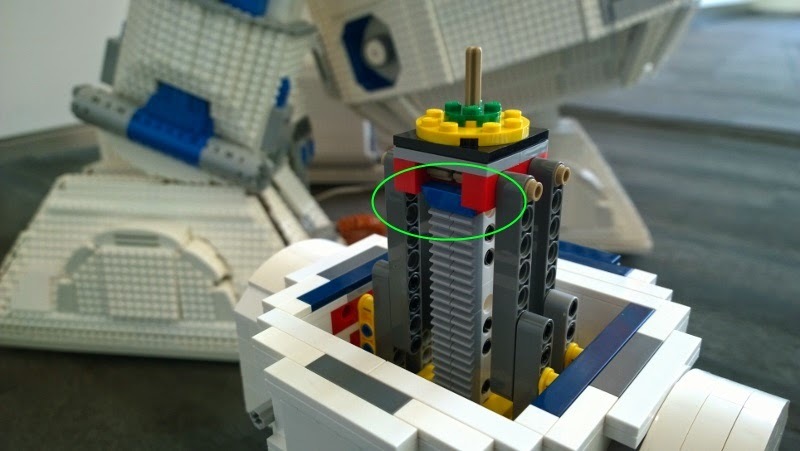 However Lego's instructions for the UCS R2-D2 don't provide the right angle. I didn't know the exact amount when I build the 10225 Lego kit, but I could tell that it looked wrong. He looks like he's about to fall on his face. 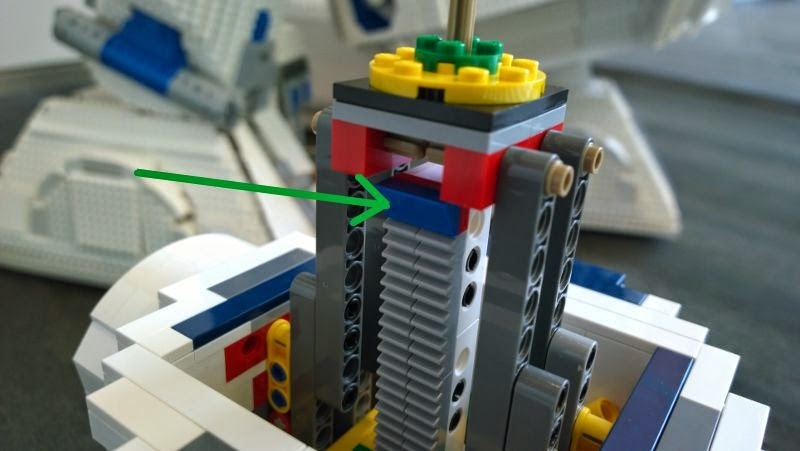 I drew a red line sort of along the middle of the bad angle Lego kit and a green line in L3-G0's centerline. As you can see they're pretty far off. Notice that the back legs aren't too bad, it's just the angle of the body. To fix it, all we have to do is make the middle leg a little longer. To do that I moved the stop up one stud to the top of the leg support - and all of the teeth too. 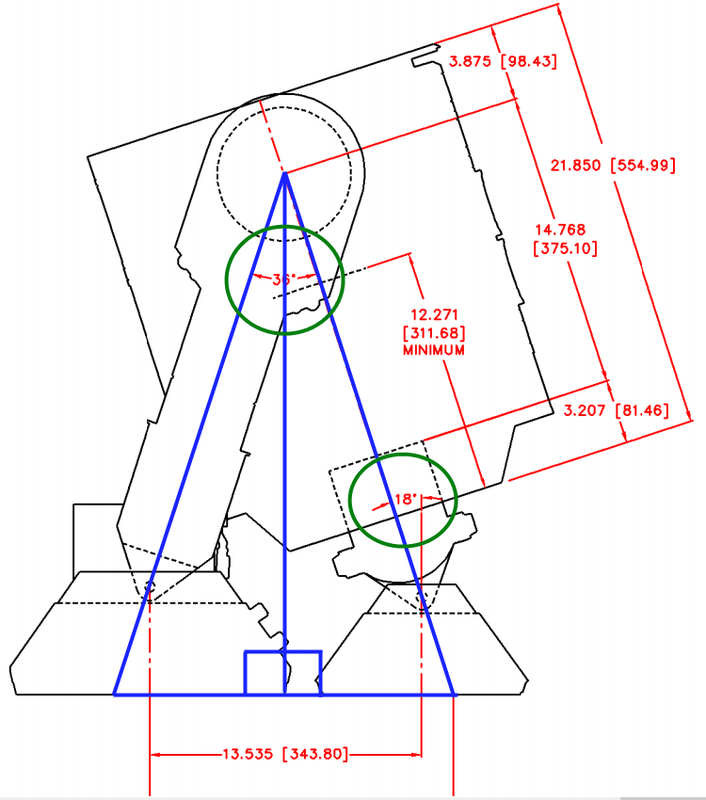 Unfortunately, that means that it hits the stop plate in the center support. That's the 4x4 plate with a 2x2 hole in the middle. When it hits the plate, the foot won't retract all the way. The fix is to remove the offending plate, which apparently isn't really needed, so you can use the cool hollow 4x4 plate somewhere else. Here's a picture showing the removed plate circled and the stop in the space the plate had occupied. Here's the result of our repaired droid. A nicely inclined astromech at the same angle of the full size one. 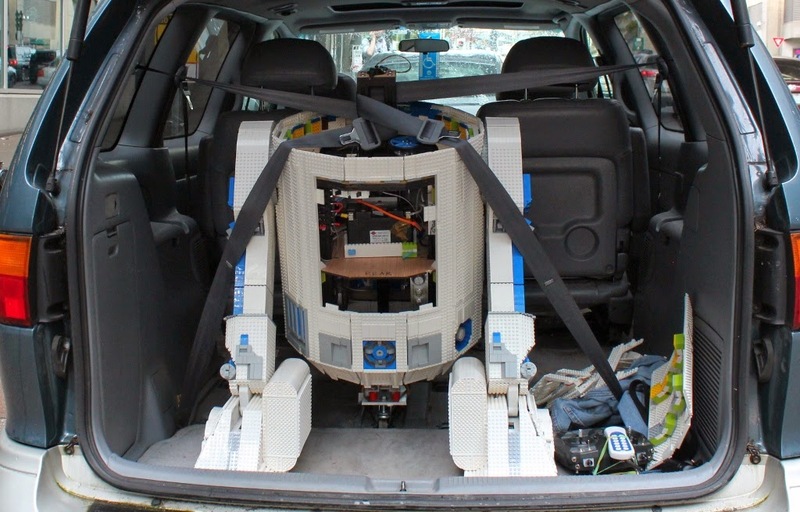 Anyway, I hope this post helps save the world from Lego R2-D2s that look like they're about to fall on their faces! I'll leave you with an annotated copy of on of the R2-D2 Builders Club diagrams showing the correct dimensions of an Astromech Unit. I've added the 36 & 18 degree angles in blue triangles. 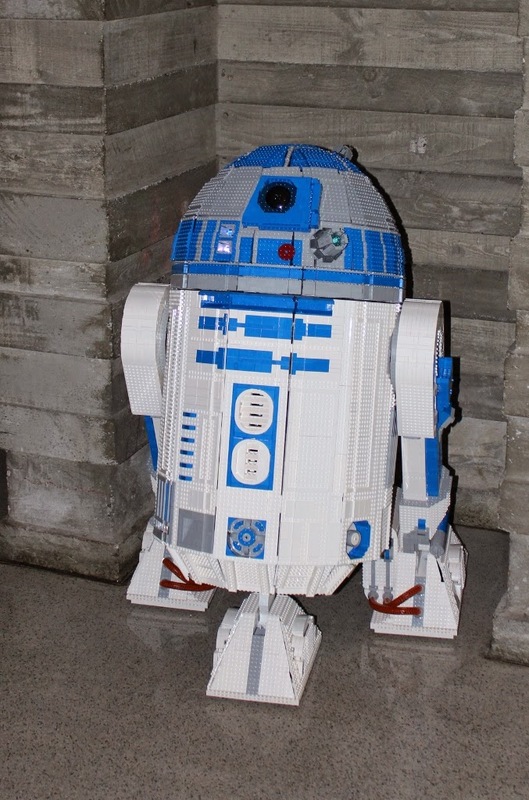 Now I know I'm truly way too much of an R2 geek!